I've had a few folks asking for active bass cutter circuit for couple of different uses. 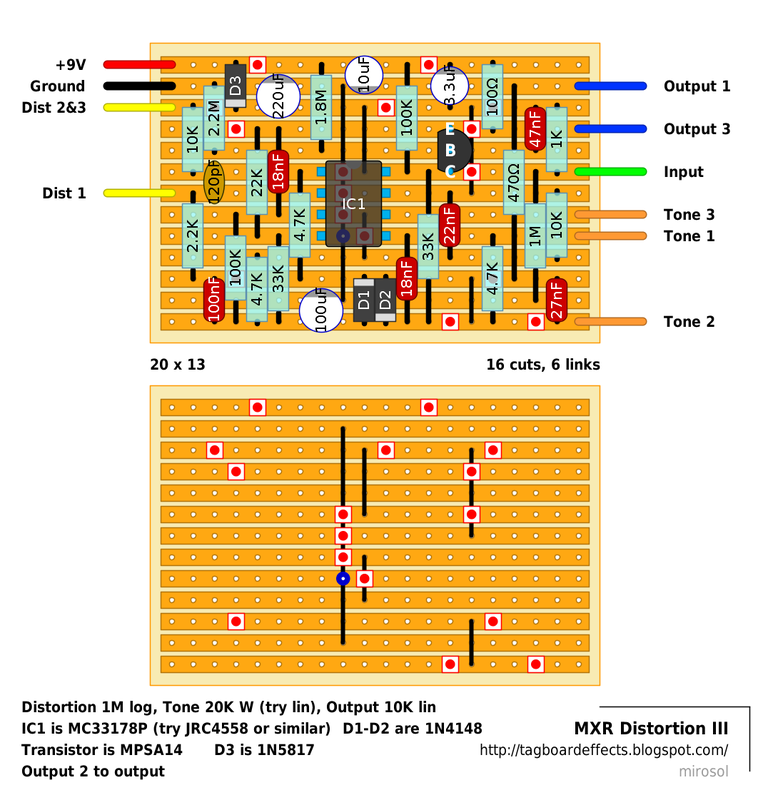 First, a lot of stoner rock enthusiast want to split their signal for two amps and some blues folks want to do that too. And since in cases like these, the second amp is usually a guitar amp, which will perform in a happier manner if we don't feed them the lowest frequencies. I got tipped off with HPF Technology's HPF-Pre 2. Even though the main aim for the design is to address issues with double basses, the circuit will work great on other applications as well. This design is open and for mainly that reason, i strongly recommend getting an original unit if you find use for this circuit. The price is more than just right, so your savings won't be much by building one. So. If you can, please support the orginal design. I built one already to see if the board works with J201s and 2N3906. It does. 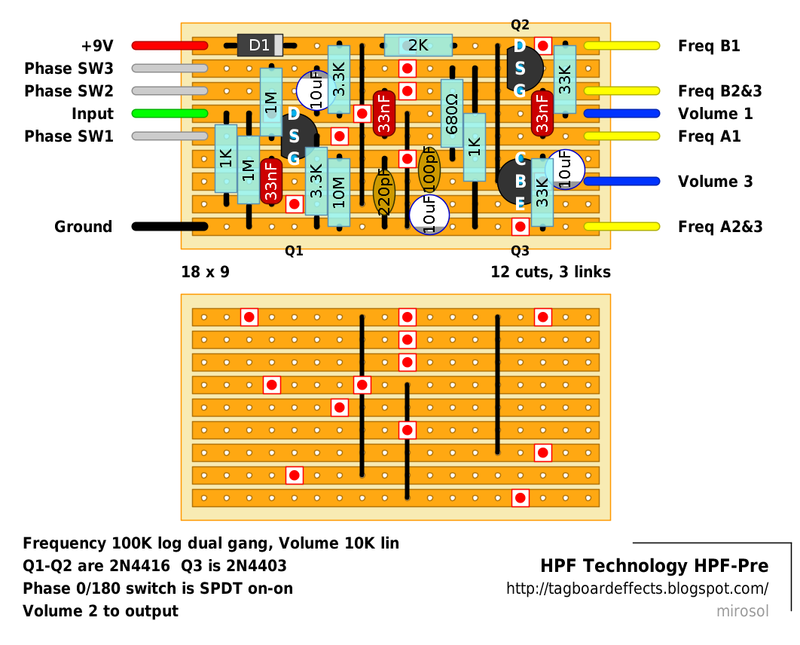 The frequency pot should definitely be dual gang logarithmic taper. HPF-Pre is a preamp with adjustable high pass filter and phase switch for use with piezoelectric pickups on the double bass. It is intended to address the primary issues faced by bassists when playing through mainstream amps and PA systems. Foremost, HPF-Pre is a preamp. Its high input impedance ensures proper buffering of the signal from piezo pickups. It is battery powered and housed in a tough plastic enclosure with internal shielding. An adjustable high pass filter tunes out the subharmonic “thump” generated by the plucked bass, which otherwise can drive ported bass speakers to over-excursion. It is also a useful tool for coping with adverse acoustical environments and PA systems with excessive subwoofer support. A phase (polarity reversal) switch is provided to help control feedback problems. It could also help when setting up systems with multiple pickups, or a pickup and a microphone. Series 2 of the preamp adds an output volume control and an LED battery status indicator. The volume control is handy when your stage setup requires your amp to be out of arm's reach. HPF-Pre is an "open" design. I sell the HPF-Pre at a modest price from my part-time home business. Otherwise, you are welcome to build your own.